The Halloween shelves are shrinking with the last of the cackling skeleton brides and tombstones. There are some turkeys overlapping them, but Christmas and winter holidays are coming on strong. I see you, giant nutcrackers and elves, just on the other side of the shelf. Halloween is almost here, our last revelry of this spooky season, but the creepy celebration isn’t over. I’ll be writing about scary things through November for NaNoWriMo. 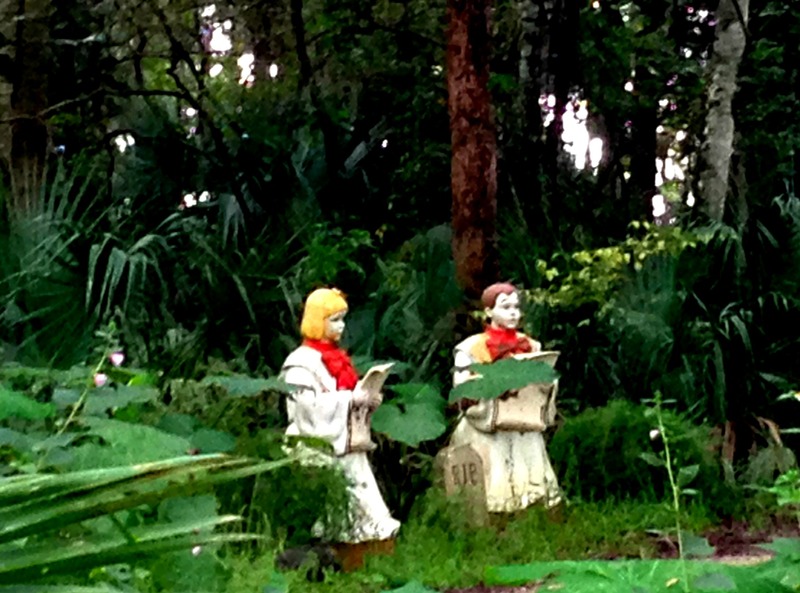 And I’ll be finding inspiration in my beloved swamps, like these carolers guarding a grave. Are they singing songs of celebration or lamentations? Or an endless, hellacious round of Jingle Bells to torment the poor soul?